Thomas Wolsey (c. March 1473 – 29 November 1530) was an English political figure and a cardinal of the Roman Catholic Church. When Henry VIII became King of England in 1509, Wolsey became the King's almoner. 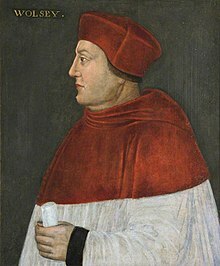 Wolsey's affairs prospered, and by 1514 he had become the controlling figure in virtually all matters of state and extremely powerful within the Church. The highest political position he attained was Lord Chancellor, the King's chief adviser. In that position, he enjoyed great freedom and was often depicted as an alter rex (other king). He fell out of favour after failing to negotiate an annulment of Henry's marriage to Catherine of Aragon and was stripped of his government titles. He retreated to York to fulfil his ecclesiastical duties as Archbishop of York, a position he nominally held but had neglected during his years in government. He was recalled to London to answer to charges of treason—a common charge used by Henry against ministers who fell out of favour—but died en route of natural causes. Master Kingston, I see the matter against me now it is framed; but if I had served God as diligently as I have done the King He would not have given me over in my gray hairs. To the messenger summoning him to see Henry VIII.. I am come to leave my bones among you. To the Abbot of Leicester, knowing that he was dying. Be very, very careful what you put into that head, because you will never, ever get it out. Attributed to Cardinal Wolsey by columnist George Will, a line that he says was "uttered about Henry VIII", as quoted in William A. Henry In Defense of Elitism (Anchor Books, 1995), p. 45. How high his Highness holds his haughty head! Attributed to Cardinal Wolsey in English Etymology; Or, a Derivative Dictionary of the English Language (1783) by George William Lemon, "Alliteration". This page was last edited on 22 December 2018, at 19:32.